The Jomon period is approximately from 16,500 to 3,000 years ago (the tenth century B. C. ) in terms of date, developed from the end of the Pleistocene epoch to the Holocene epoch in the Japanese archipelago in terms of geological age, and is comparable to the Mesolithic period or the Neolithic period in terms of the world history. 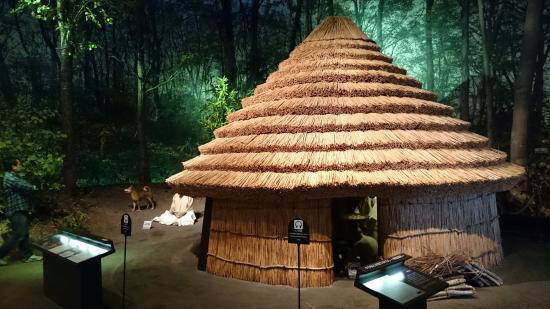 The main differences between the Paleolithic period and the Jomon period are the emergence of the earthenware, the spread of tateanajukyo (a pit dwelling house) and the style of shell mounds. The end of the Jomon period, that varies greatly in different regions, was marked by the emergence of the Yayoi culture characterized by typical paddy cultivation; however, many scholars have different theories about the date, which was placed sometime between the tenth century B. C. and several centuries B. C.
Incidentally, the Jomon period is included in the Okinawa Shell mound period in Okinawa Prefecture&apos;s history. The subsequent period is the late Shell mound period which is also known as the Post Jomon period in the northern Tohoku region and Hokkaido. The Jomon period is the term for the time when Jomon earthenware was in use; however, it comes to include the characteristics of people&apos;s lives at the time and to describe the society characterized by the ability to produce ground stoneware, the use of earthenware, the economy based on hunting and gathering, and the sedentary life. The diversity of Jomon earthenware can be used to determine time and identify regional differences. The Jomon period is divided into six periods according to styles of earthenware: the incipient period, the earlier period, the early period, the middle period, the end period, and the last period. In the beginning of the study, there were only three periods, the early period, the middle period, and the end period; however, the earlier period and the last period were added due to the increase in available materials and the progress of research and the incipient period was added lastly. The periodization reflects the development of the earthenware study; therefore, the middle period does not correspond to the middle period in the Jomon period. Periodization needs to be reconsidered taking into account the people&apos;s regular vocation or the content of the cultural development; however, it is commonly used and well-established. The periods measured in the carbon-14 dating method using AMS technique are the following: the incipient period (approximately from 15,000 to 12,000 years ago), the earlier period (approximately from 12,000 to 7,000 years ago), the early period (approximately from 7,000 to 5,500 years ago), the middle period (approximately from 5,500 to 4,500 years ago), the end period (approximately from 4,500 to 3,300 years ago), and the last period (approximately from 3,300 to 2,800). In addition to periodization based on the sequence of Jomon earthenware, another method of periodization uses different aspects of the Jomon culture to divide the Jomon period into several periods. Scholars have different methods to determine how the Jomon period fits into cultural history and so far there is no established theory by academic circles. After the last glacial period peaked approximately 20,000 years ago, the temperature warming took place on a global scale. However, the environment had such rapid and severe changes in the short period of time that the cold period changed into the warm period in the several hundred years in the last glacial age called the late glacial stage approximately from 13,000 to 10,000 years ago. Until then, the conifer forests covered much of the Japanese archipelago; however, the deciduous broad-leaved forests grew and spread from southwest Japan along the coast of the Pacific and the deciduous broad-leaved and the laurel forests came to cover much of the Japanese archipelago except Hokkaido. The nuciferous trees such as Quercus, Fagus, and Castanea came to grow in the forests. Change in the vegetation due to the warm temperature worsened the habitat environment for large mammals such as mammoths, reindeer, Naumann elephants, and elks; as a result, these large mammals were almost driven to extinction by approximately 10,000 years ago in the Japanese archipelago. Characteristics of the incipient period are pointed out as follows. Many new tools were invented in a short span of time. For example, looking at the stone tools, large ground stone axes, stone spear-heads, inserted stone blades, half-moon shaped stone tools, pointed stone tools, shaft abraders, and stone arrowheads were invented during this period. The obsolete stone tools were replaced with the new stone tools in rapid succession. In the first half of the incipient period, the combinations of stone tools vary by the remains. The new tools were invented quickly in succession to accommodate environmental changes such as vegetation and animal fauna due to the rapid change in climate and shoreline migration. The productivity improved dramatically with the establishment of three regular vocations, hunting, gathering, and fish catching. The people in the Paleolithic period in the Japanese archipelago hunted large, medium, and small mammals. The large mammals migrated extensively by the season; therefore, the people in the Paleolithic period followed migration patterns and frequently moved from one place to the next setting up camps along the way. Several thousand sites with slaughter-houses and blocks, with mounds of small stones and charcoal remains were discovered in the Japanese archipelago; however, the remains with facilities such as tateanajukyogun were hardly discovered. 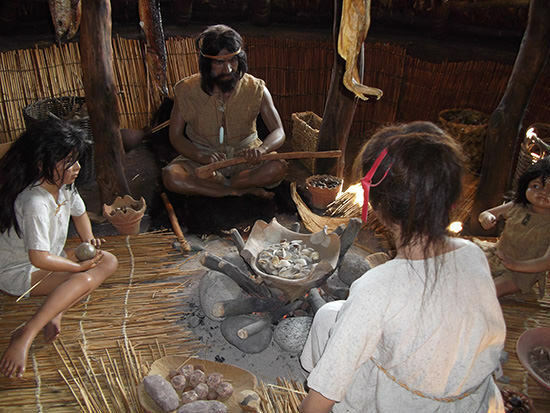 The people in the Paleolithic period frequently traveled from one place to the next while engaged in camping and nomadic life until the end of the Pleistocene epoch. 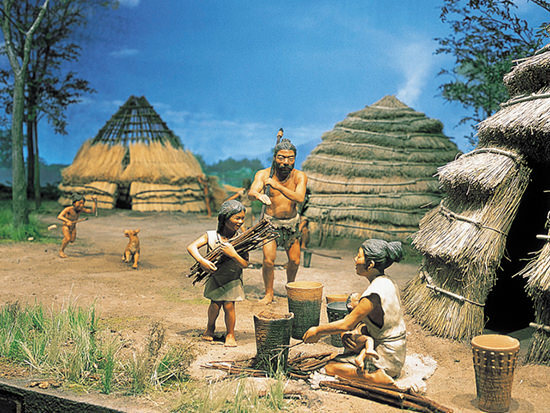 Then, during the incipient period, the transitional period from the Paleolithic period to the Jomon period, people came to settle temporarily in specific locations and lived in semi-sedentary settlements. By the earlier Jomon period, sedentary settlements appeared. At the Kakuriyama remains (from the beginning of earlier Jomon period) in Kagoshima City, the remains of tateanajukyogun with sixteen dwellings, of the thirty-three fire pits with smoke paths, and of the seventeen underground pit ovens were discovered. The number of remains of tateanajukyogun greatly increased, the dwellings were expanded, the dwelling sites were overlapped and these remains of the dwellings and other structural remnants were placed around an open space in the center at the Kakuriyama remain which is different from the Sojiyama remains or the Maeda remains from the incipient period. The remains of tateanajukyogun with forty-six dwellings and many other structural remnants were discovered at the Uenohara remains in Kirishima City, Kagoshima Prefecture built during the same period as the Kakuriyama remains. The thirteen out of fourty-six dwellings were covered within the Sakurajima Island&apos;s stratum, the volcanic ash originated in Sakurajima Island; therefore, it is assumed that they existed during the same time period. Since these 13 dwellings were arranged in a semi-circle, it is assumed that the sedentary settlement of a considerable scale was established by the beginning of the earlier period. The tateanajukyogun spread most notably in the Kanto region during the first half of the earlier Jomon period. Until now, sixty-five remains were found with tateanajukyogun and the total number of dwellings exceeded 300. 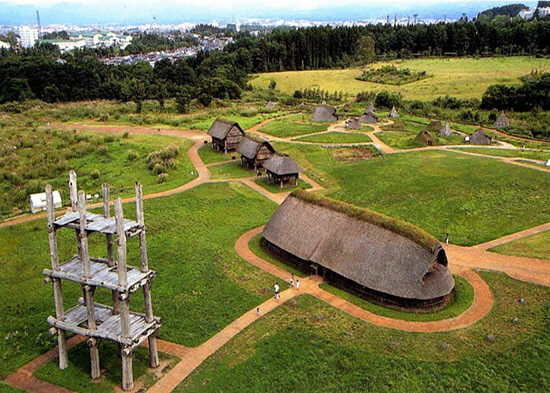 The tateanajukyogun with twenty-four dwellings and many pits arranged in a semi-circle were discovered at the Musashidai remains in Fuchu City, Tokyo, one of the largest remains in scale among these sixty-five remains. In the remains found in the southern Kanto region and southern Kyushu in the first half of the earlier period, the cookware for plant foods such as stone dishes, mill stones, hammer stones, and heat-treated earthenware grew in size and the number of excavated objects increased. The main food source is thought to be of plant foods especially nuts during the sedentary life. It is assumed that not only plant gathering activities but also the fish catching activities played important roles in establishing sedentary settlements in the southern Kanto region. Meanwhile in the north, at the Nakano B remains from the middle of earlier Jomon period in Hakodate City, Hokkaido Prefecture, the remain of tateanajukyogun with over 500 dwellings, many remains of tateanajukyogun, hole-shaped graves, pitfalls, many pieces of earthenware, stone dishes, mill stones, hammer stones, stone sinkers were excavated; the total number of items reached over 400,000. The Nakano B remains were located on the plateau facing the Tsugaru Channel; therefore, it is assumed that sustaining a sedentary life over a long period of time was possible since the fishing was the activity pursued. In addition, at the Wakamiya remains in Fujinomiya City, Shizuoka Prefecture, the early example of the sedentary settlement in the Tokai region, the tateanajukyogun with twenty-eight dwellings and many other groups of structural remnants along with approximately 18,000 pieces of earthenware and stone tools were excavated. The big difference between the Wakamiya remains and other remains from the earlier period is that 2,168 pieces of Sekizoku (flint arrowheads) for hunting were excavated at the Wakamiya remain. The Wakamiya remains were located at the foot of Mt. Fuji where many small valleys were formed and the terrain was covered with continuous tongue-shaped plateaus and was just the right living environment for mammals. Therefore, it is assumed that the Wakamiya remains were blessed with favorable conditions such as a good environment and plenty of prey for maintaining a sedentary life. The transition from nomadic life to a sedentary life brought one big change in the environment. The change was revealed from the result of the plant opal phytolith analysis. 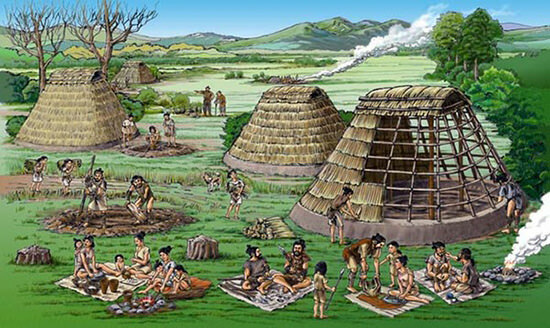 The semi-sedentary life, settling temporarily in specific locations, didn&apos;t afford the reclamation effort of surrounding areas; however, when the Jomon people adopted a sedentary life, they cut down the laurel and deciduous forests surrounding their settlements and cleared the space for secondary forests (secondary vegetation) of chestnut, walnut, and other trees. The Jomon people had an impact on the forest floor plants, co-called undergrowth, around the settlements by adopting the sedentary life. Plants such as brackens, flowering ferns, Japanese butterburs, Japanese arrowroots, yams, and Japanese garlics grew and prospered easily in the newly created secondary forest environment, the new environment known as copses, and became steady food resources for the Jomon people. By observing the relics excavated from the remains, it is assumed that chestnut trees were used predominantly for building materials and fuel in the Jomon period; it is also certain that chestnut forests surrounded the settlements during the Jomon period. There is not a universal definition of the Jomon culture: therefore, it is not possible to define the geographical distribution of the Jomon culture that applies uniformly. Using the criteria based on the distribution of the Jomon earthenware, the northern limit is Cape Soya and the Kurile Islands and the southern limit is the islands of Okinawa; the Jomon earthenware is not distributed in Miyakojima Island and the Yaeyama Islands (the earthenware found in Miyakojima Island and the Yaeyama Islands belongs to the family of the earthenware found in Taiwan). In other words, the distribution of the Jomon earthenware is not confined strictly within the border of today&apos;s Japan. The Jomon period experienced a large-scale climate change since it extended for a long period of 10,000 years. The Japanese archipelago is extremely elongated from north to south and its topography varies considerably; therefore, regional differences in the climate and vegetation were large during the Jomon period as is today. 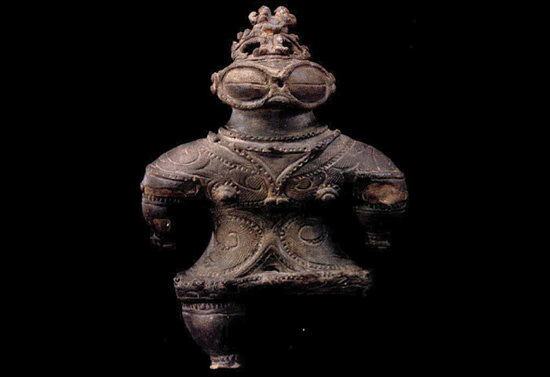 As a result, the cultural style of the Jomon period is not uniform both historically and regionally and it came to take many different forms. The temperature of the earth gradually warmed from the end of the last glacial age to approximately 4,000 B. C. This period corresponds with the incipient period to the early period in the periodization based upon the sequence of Jomon earthenware. The Japanese archipelago experienced a rise in the sea level of over 100 meters during this period; today it is called the sea level rise of the Jomon period. The Japanese archipelago during the incipient period was cold and the vegetation cover was mostly dry meadows; however, forests of deciduous trees appeared in some regions. In terms of geography, Hokkaido and Sakhalin were connected, Tsugaru Straits was frozen in the winter, and Hokkaido was connected to the present Honshu Island. The Seto Inland Sea didn&apos;t exist yet and Honshu, Shikoku, Kyushu, Tanegashima Island, Yakushima Island, and Tsushima Island were connected and existed as one big island. This big island and the Korean peninsula were separated by only a fifteen-kilometer-wide waterway. Later, due to the sea level rise in the above mentioned, the waterway between Tsushima Island and the Korean peninsula widened and became the Korea Strait; as a result, Tsushima Danryu (warm current) came to flow into the Sea of Japan. The change in the current resulted in a snowy area and the forests of beech and other trees were formed with the abundant snowmelt on the Sea of Japan side in the Japanese archipelago. The sedentary settlements appeared in the earlier Jomon period; in addition, several new cultural elements such as the start of the full-fledged fishery and of traveling on the outer sea in the Kanto region were added. The oldest sedentary settlement was discovered in the southern Kyushu region; it is assumed that seasonal settlement began approximately 11,000 years ago and permanent settlement throughout the year began by approximately 10,000 years ago. The reason for adopting sedentary life is assumed that the problems the Jomon people had in order to adopt the sedentary life up to that time were being solved; in fact, the Jomon people were able to solve problems of securing food, waste disposal issues, and the need to come to terms with the view of life and death in the sedentary life. The earthenware in this time period is classified into three styles, Northeast Asia, North/Center China and South China and in terms of the distribution, the Northeast Asian style earthenware was excavated in Hokkaido to eastern Japan, the North/Center China style earthenware was excavated in western Japan, and the South China style earthenware was excavated in southern Japan. In terms of vegetation, the laurel forests were limited along the coasts of Kyushu and Shikoku as well as the coast of the Pacific from the Kanto region and to the west in the first half of the earlier Jomon period; the deciduous forests were predominant in other regions. 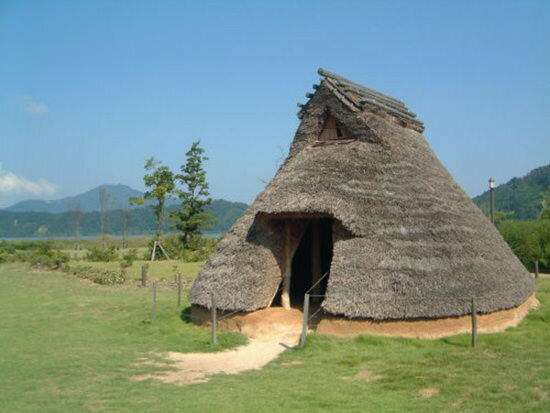 From the early to middle Jomon period was the time when the most typical Jomon culture flourished; the characteristics of this Jomon culture can be observed in the belongings of the Jomon people who lived at the remains called Sannai-Maruyama today. It is assumed that roughly the nine cultural regions were established in the Japanese archipelago during this period (mentioned below). The sea level was three meters higher and the climate was warmer than today in the middle of the early Jomon period. Kensaku HAYASHI pointed out that during this period good fishing grounds emerged in coastal regions because of the so-called the sea level rise of the Jomon period and marine products became easily available. In terms of vegetation, west of Sekigahara came to be covered mostly by laurel forests. By the end Jomon period, the temperature changed to cooling trend again and the food production declined. As a result, the population of the Jomon people turned to stagnate or decline. The tidelands, good fishing grounds for shellfish, diminished rapidly in the Kanto region and the shell mounds disappeared together. On the other hand, the wetland areas expanded in western Japan and the Tohoku region; as a result, the cultural style suitable for the wetlands had developed. The types of nuts mainly available for harvesting changed rapidly from chestnuts to buckeye in Chubu and Kanto regions. In addition, the analysis of pollen revealed that the main crop changed from buckeye to buckwheat at the Kamegaoka remains in Aomori Prefecture. The nine cultural regions were consolidated into four cultural regions. The framework of the four cultural regions was passed onto the Yayoi period. It is pointed out that the Jomon culture was not uniform in all the regions in the Japanese archipelago, but was a collection of cultural styles representing many regional differences. 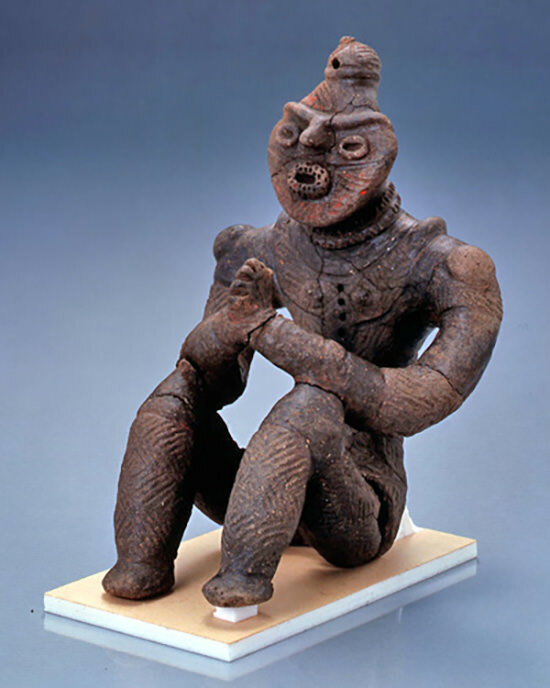 The earthen figures created by the Jomon people were not used universally in all the regions in the Japanese archipelago through all the time of the Jomon period; their use was limited in terms of both the periods and the regions. 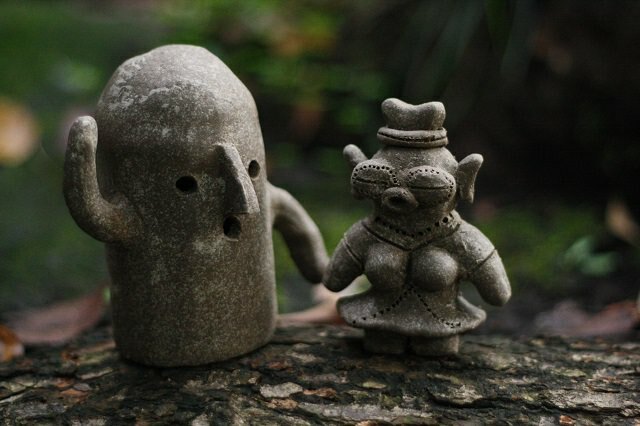 In fact, the use of the earthen figures had disappeared for a time in the middle of the Jomon period after they were used extensively in the east part of the Kanto region in the first half of the earlier Jomon period. 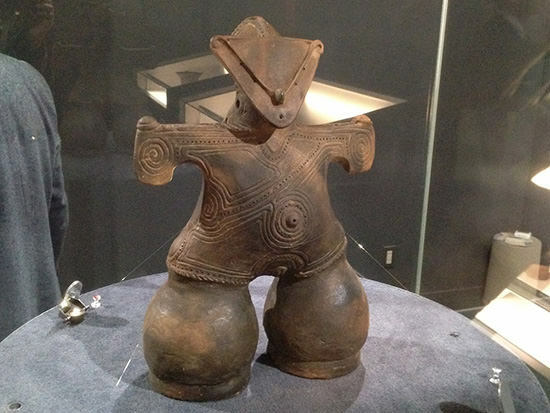 Afterwards, earthen figures came to be used again in eastern Japan in the first half of the end of the Jomon period. 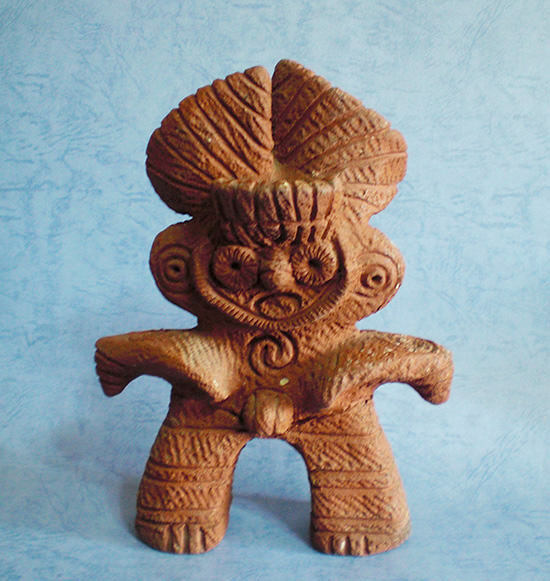 On the other hand, earthen figures appeared in the northern Kyushu and Chubu regions during the end of the Jomon period; the use of the earthen figures had not seen in Kyushu until then. Fujio explains that the regionality of the earthen figure use might be related to the difference in the main food supplies available in the regions, the difference between the regions where the main food supplies were the nuts, beech, oak, chestnut and buckeye etc. , from the deciduous trees (that is, these regions covered with deciduous forests) and the regions covered with laurel forests in much of the western Japan. 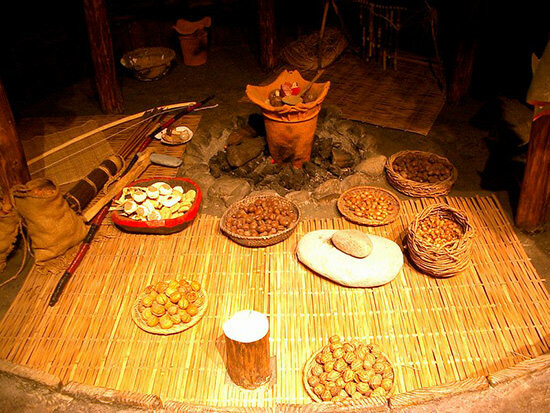 Fujio presumes that the nuts from deciduous trees such as acorns and the chestnuts were harvested during a relatively brief period of time in autumn; therefore, a consolidated labor by a fairly large settlement was necessary and the Jomon people used the earthen figures to conduct religious services in order to promote solidarity in the society. 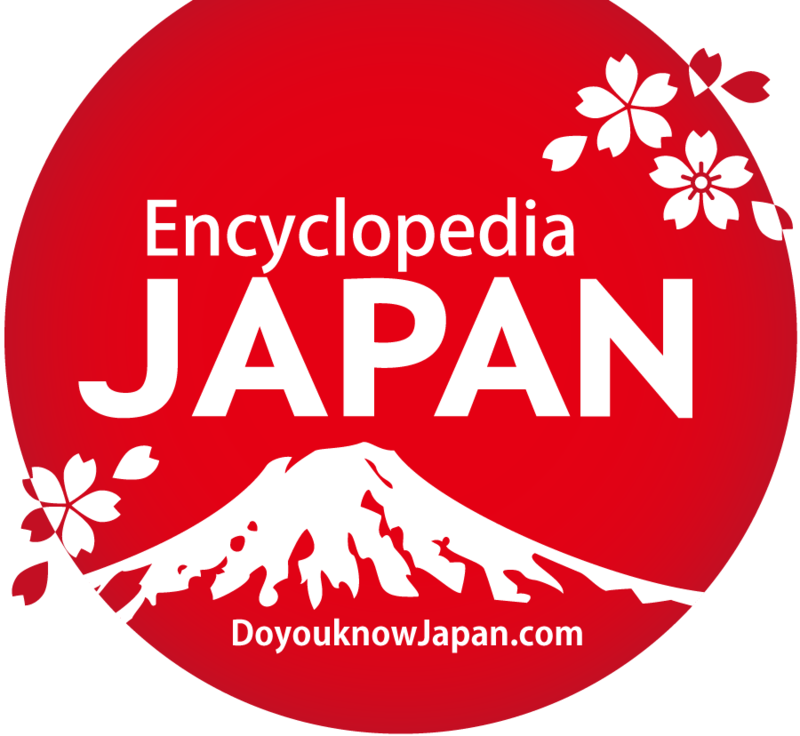 As mentioned above, it is assumed that nine cultural regions were established in the Japanese archipelago by the early Jomon period. They are the following nine regions. The conifers such as Yeddo spruce and Todo fir were predominant in the area. The big difference from other regions was that chestnut and buckeye were not distributed in the area. Sea animals such as sea lions, earless seals, and fur seals lived in the cold current and were abundant; the tool to catch them, a harpoon with a detachable screw-head, was developed. Vegetation cover was mostly deciduous forests unlike the eastward of Ishikari Lowland. The nuts from the trees such as Mizu-nara (Quercus mongolica var. crispula), Ko-nara (Quercus serrata), walnut, chestnut, and buckeye were actively harvested. People in this region hunted sea animals with a harpoon with a detachable screw-head; however, unlike the people living eastward of Ishikari, they also hunted mammals, antelopes and wild boars, on land. Deer and wild boar from the land as well as skipjacks, tunas, sharks, and dolphins from the sea were the main sources for animal-derived foodstuff. Unlike the second cultural region, the warm current was dominant offshore in this cultural region; therefore, the sea animal hunting in the cold current was not possible. The plant-derived foods from the laurel forests and fish catching in the inner bay areas were the characteristics of this cultural region; especially, approximately sixty percent of shell mounds excavated in the entire Japanese archipelago were from this cultural region. Deer and wild boar were the main sources for animal-derived foodstuff from the land. Clams and the littleneck clams were gathered from the sea; in addition, the sea basses and the giltheads were consumed in large quantities. These marine products were caught in the inner bay areas and nets with earthenware sinkers were used. Deer, wild boar, and black bear were the main game for hunting. Vegetation cover was mostly deciduous broad-leaved forests (buckeye and oak); since it was a snowy area, the houses grew in size. The main game for hunting were deer and wild boar; the vegetation cover was mostly deciduous broad-leaved forests, but yams and lily bulbs were consumed as food. The use of chipped stone axes was one of the characteristics of the region. The main game for hunting were deer and wild boar and the vegetation cover was mostly deciduous broad-leaved forests and chinquapin and oak were also found. In terms of fishery, the use of stone sinkers with slits (the sinkers for nets shaped out of stone) was the characteristic of the region; it is assumed that the technique of using earthenware sinker pieces in the Kanto region was handed down and lead to the use of the stone sinkers with slits. The main game for hunting were deer and wild boar. Vegetation cover was mostly laurel forests. The most notable characteristic was open sea fishing in the archipelago that extended between Kyushu Island and South Korean peninsula; the characteristic fishing tool was the assembled fishing needle and Ishinoko (a stone saw) which was unique to northwest Kyushu region. The assembled fishing needle was the large fishing needle made of several different components tied together and the fishing needle conceived from the same idea was used in ancient Polynesia; however, the distribution range of the fishing needle found in this cultural region overlaps the region in the east shore of the South Korean peninsula where the Osanri-type assembled fishing needle was found. The Kikai caldera erupted violently in the southern Kyushu region at the end of the earlier Jomon period; the eruption caused the catastrophic damage to the area which was thought to be virtually annihilated. Vegetation cover was mostly laurel forests. Sea turtles and dugongs were consumed for food as sources of animal protein. The fishing in the coral reef was one of the characteristics of the region; as for the fishing tools, shells, tridacna shells, and porcelain shells, were used for sinkers for fishing nets. There were cultural exchanges with the Kyushu cultural region. Makoto WATANABE points out that variances among these nine cultural regions are not differences within one cultural region known as the Jomon culture, but rather these nine cultural regions have to be thought of as &apos;independent regional cultures with the similar developmental characteristics. &apos;In other words, all of these cultural regions didn&apos;t share a common set of cultural elements differing only in details; instead, each cultural region selected and maintained several cultural elements suited for the environment in each region. Therefore, it is not surprising to know that an element found in one cultural region might not be found in another region. Five out of nine cultural regions, &apos;Hokkaido/the southwest Ainumoshiri and the northern Tohoku region,&apos; &apos;the southern Tohoku region,&apos; &apos;the Kanto region,&apos; &apos;the Hokuriku region,&apos; and &apos;the Tokai and Koshin regions,&apos; were consolidated into one cultural region, (&apos;the oak forests culture&apos; according to the culture theory of laurel forests), in the end Jomon period; also &apos;Kaga, Noto, Echizen, the coastal areas of Ise Bay, Chugoku, Shikoku, Buzen, and Bungo&apos; and &apos;the Kyushu region (except Buzen and Bungo)&apos; were consolidated into one cultural region, (the laurel forests culture according to the culture theory of laurel forests). As a result, the number of cultural regions decreased to four during the end and the last Jomon periods. It is known that the comma-shaped bead was manufactured approximately by the middle of the Jomon period at latest (5,000 B. C. ); notably, the comma-shaped bead made of jade as well as the workshop for manufacturing the beads were discovered from &apos;Chojagahara Site&apos; in Itoi-gawa River, Niigata Prefecture. The fluorescent X-ray analysis shows that the jade excavated at &apos;Sannai-Maruyama Site&apos; in Aomori Prefecture and southern Hokkaido is from Itoigawa; therefore, it is assumed that the Jomon people traded among themselves over the wide area. The comma-shaped bead made in Japan was passed on to the Korean peninsula in later years. The cultural region on Kyushu Island and the Neolithic culture of the Korean peninsula and the Gulf of Bo Hai coast had many common elements such as chipped stone saws and assembled fishing needles; therefore, it is assumed that there were constant exchanges between the peoples and goods among these regions. One theory explains that the technique of cultivating millet appearing during the end of the Jomon period was introduced from the continent. The farming theory of the Jomon period has a long history of study since the Meiji period and the existence of farming is still being debated today. It is agreed that the people certainly cultivated plants during the Jomon period. The cultivated plants were found from the layer of the Torihama shell-mounds in the early period in Fukui Prefecture and bottle gourds were found from the layer of the earlier period. On the other hand, it is thought that there was a strong likelihood that the burn agriculture was employed at the remains in the end and the last periods in the northern Kyushu region. Rice and barley were detected by the plant opal phytolith analysis of the soil of remains and the clay of the earthenware in the Kumamoto Prefecture, by the pollen analysis of remains in Fukuoka Prefecture in the end and the last periods, and at the remains in the Kumamoto City; rice was detected at the remains in Oita Prefecture. Likewise, buckwheat pollen was detected at more than ten remains in eastern Japan at the end and the last periods. It is presumed that crops were cultivated by burn agriculture as well. Today, the plant opal phytolith analysis shows that tropical Japonica was cultivated by burn agriculture during the end and the last Jomon periods. The rice varieties are classified into Japonica (Japanese type) Javanica (Java type) and Indica (Indian type); Japonica is further classified into temperate Japonica and tropical Japonica. Temperate Japonica is distributed in the very limited area from the northern Yangtze River in China to the Japanese archipelago and closely related to wet-rice agriculture. It is assumed that the rice cultivated by wet-rice agriculture since the Yayoi period is also temperate Japonica. The distribution of Indica is wider and overlaps partly with tropical Japonica; in addition, it is assumed that the characteristic of cultivation of the Indica is closely related to the upland rice agriculture. 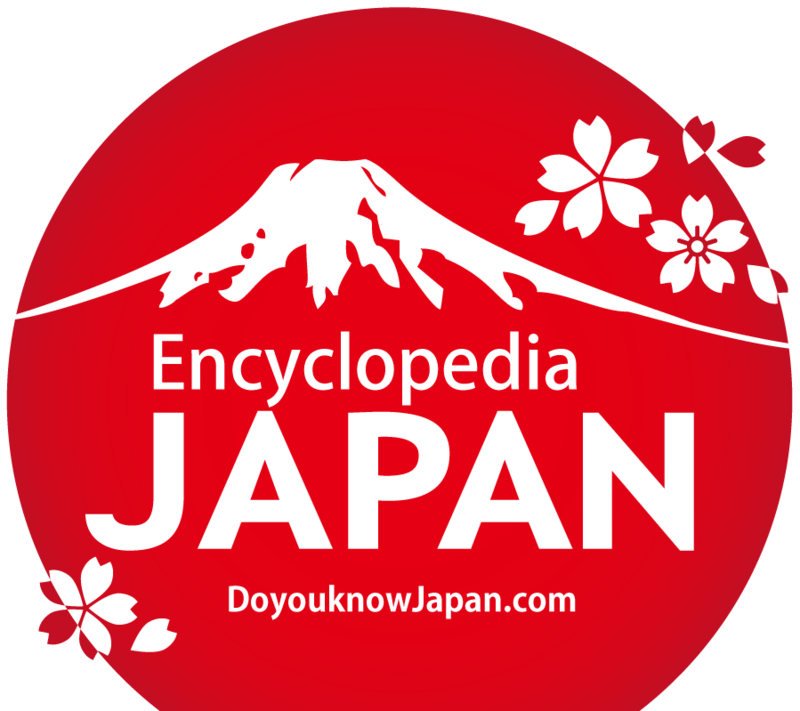 At first, tropical Japonica was introduced to the Japanese archipelago through the Nansei Islands. In research based upon rice plant DNA in recent years, it is assumed that the introduction of temperate Japonica cultivation by wet-rice agriculture was most likely introduced by the southern route since the variations in rice plant DNA were fewer on the Korean peninsula. Wet-rice fields couldn&apos;t be found in northern Korean until the recent period and the oldest carbonized rice found on the Korean peninsula which can&apos;t be traced back to rice found in the Japanese archipelago was from 2000 B. C. ; therefore, one theory suggests that the rice cropping was introduced to the Korean peninsula through the Japanese archipelago. Carbonized rice from the Jomon period was found at Uenohara remains in Kumamoto Prefecture during the latter half of the end period; as for the trace of rice in the clay of the earthenware with impression of rice husks detected by the plant opal phytolith analysis was found at the many remains in western Japan from the latter half of the end period. Therefore, it is certain that rice was cultivated in the Japanese archipelago in the latter half of the end of the Jomon period. However, rice was not the only crop; grain, barley, barnyard millet, millet, foxtail millet, and buckwheat, as well as azuki and soya beans were also cultivated.